Wedding shoes need to be comfortable! With this in mind many of the shoes we have chosen offer extra padding giving you exquisite comfort throughout the day. There are many shoes on the market that are less expensive but could be a false economy as they may not give you the comfort you’ll need to wear the shoes all day! Our shoes range vary from £45 - £250. The higher priced ranges may sound a luxury when paying for a wedding, but remember they can be dyed after the wedding giving you shoes that will last you for years to come. Shop online with the Wedding Accessories Boutique for quality handmade shoes not available in your local shops. 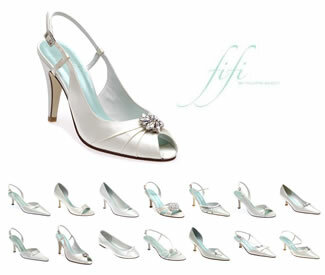 We have selected this superb range of beautiful handmade bridal & evening shoes brought to you by Filippa Scott. Filippa Scott’s shoes are fast becoming “the bridal” shoes to own. There are 2 collections to choose from by this designer. We are pleased to add the Augusta Jones collection to our online shop. A great selection of styles and colours of shoes for weddings and other special occasions at affordable prices as well as a deluxe option for each shoe style. Colours include ivory, white, cream, oyster, gold and black. Flat heel shoes as well as shoes with heel sizes up to 3 1/2 inches. Also new this year is the Meadows Bridal shoes collection. A great selection of shoe styles for weddings and other special occasions at affordable prices. The shoes have been handcrafted by skilled craftsmen. We also have a range of Meadows satin handbags. 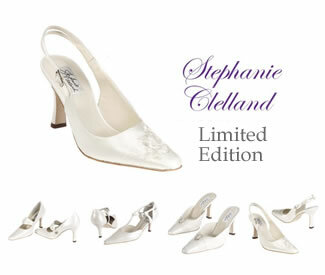 We have chosen the Stephanie Clelland range for that personal touch. Offering bespoke hand made shoes, Stephanie also offers a limited edition collection to buy on-line. Offering high quality materials with traditional hand-crafted designs. Now at Sale Prices while stocks last! After your big day why not have the shoes dyed and you could be wearing them for years to come? Please note the bespoke shoe service is no longer available, but why not take a look at the London Collection by Filippa Scott or ..